Summer and S’mores just belong together! 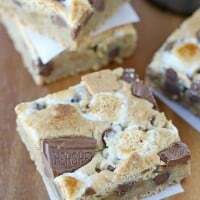 These S’mores Bars are thick, chewy and delicious… and taste like s’mores and a chocolate chip cookie combined! 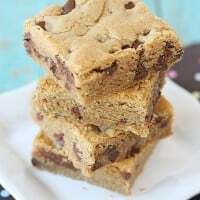 I made a batch of these scrumptious bars for a family BBQ this weekend and when I went to retrieve my plate, there was nothing on it but a few crumbs! 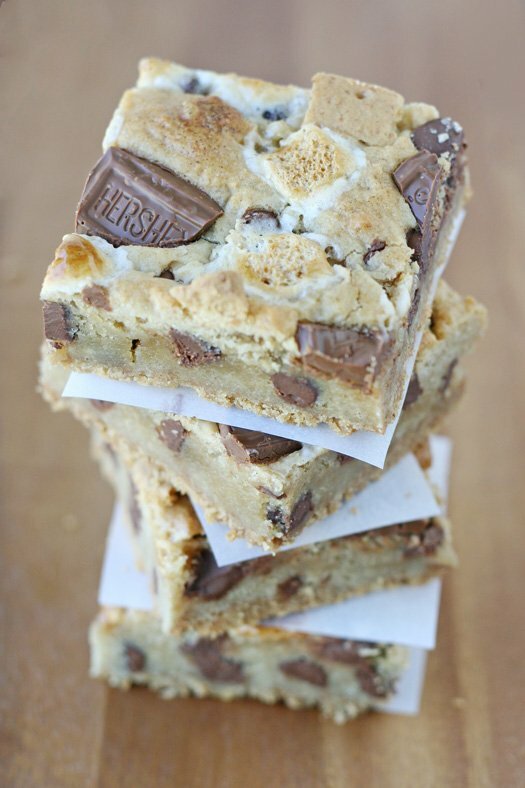 I’m sure I’ll be making these S’mores Bars several more times this summer! These bars are thick, chewy and delicious! It's like a S'mores and a chocolate chip cookie had a baby! 1. Preheat oven to 325*F and line a 9"x13" baking pan with parchment paper (or foil). Leave some paper hanging over the sides so you can easily pull the bars out of the pan after baking. 2. Crush graham crackers, then combine 1/2 cup melted butter with crumbs and stir until well combined. Pour mixture into prepared pan, and press evenly into the bottom of the pan. 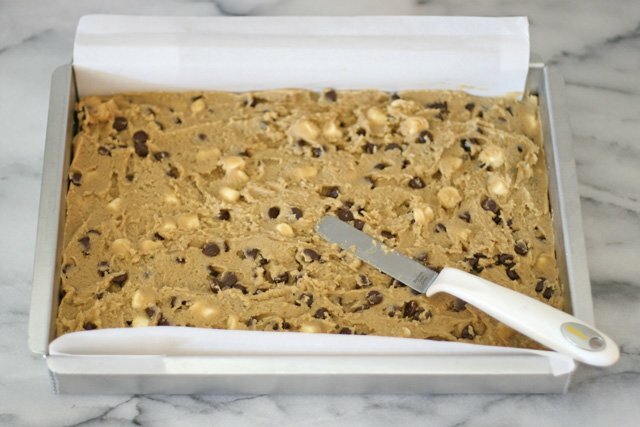 Put entire pan into the freezer while you make the cookie dough. 3. In a large mixer, blend together both sugars and the melted butter. Add eggs (one at a time) and vanilla and continue to blend until well combined. 4. In a separate bowl, add flour, baking powder and salt. Then, while the mixer is on low, slowly add the flour to the butter/sugar mixture. Stop the mixer immediately when you have added all the flour. Add the marshmallows and chocolate chips and blend until all of the ingredients are well combined. 5. Retrieve the baking pan from the freezer and scoop the dough on top of the prepared crust. Use an offset spatula to carefully spread until evenly distributed. 6. Top the dough with the toppings listed, pressing them into the dough slightly. 7. Bake 35-45 minutes, or until the top is golden brown, and there is no wet batter visible. 8. Remove from oven and allow to cool FULLY before cutting (1 hour or more). For easiest cutting, run a knife around any edges that are touching the sides of the pan, then pull up on the parchment paper and place giant bar on a cutting board. Prepare the simple graham cracker crust, press into pan and put the entire pan in the freezer to firm up while you make the cookie dough. Mix up the cookie dough batter, then spread onto the prepared crust. 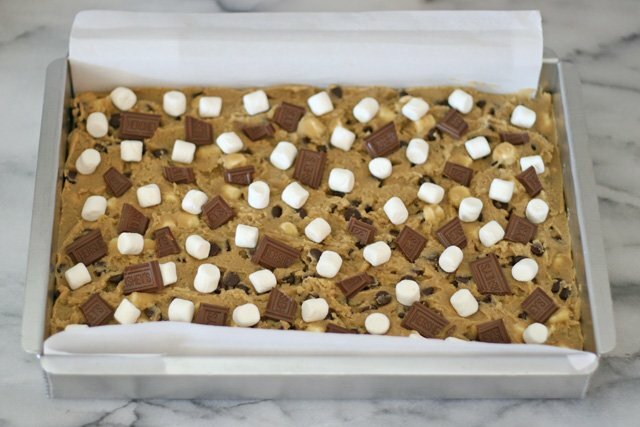 Top the cookie dough with mini marshmallows, chocolate bar pieces and graham cracker pieces (not shown, opps!). Bake, cool and enjoy!! 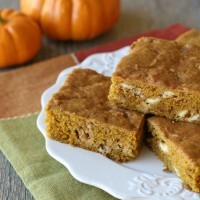 The hardest part of this recipe is waiting for the bars to cool before digging in! 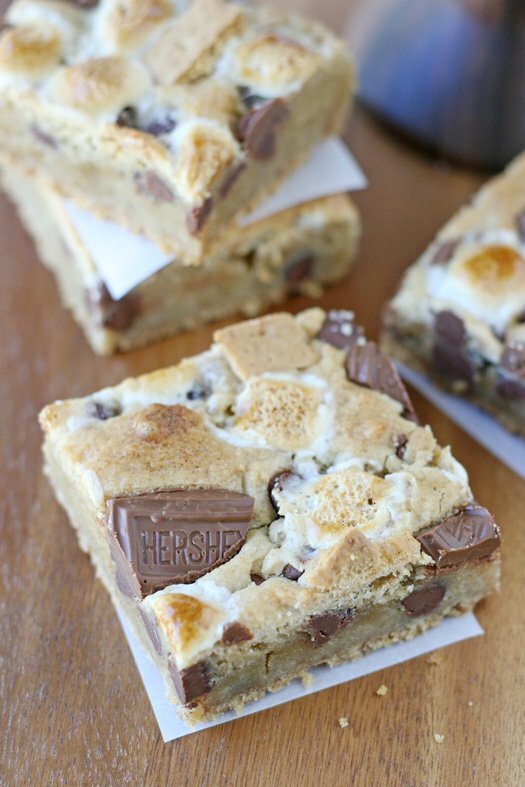 These S’mores bars would be extra incredible topped with a scoop of vanilla ice cream! These bars look sooooo yummy!! I love anything with s’more in the title! Those bars are looking so tasty! Great recipe! Wow, these look sooo good. I’m salivating all over my computer right now! How about I just bring them Wednesday? =) That was my plan! These look too perfect! Love how chewy and soft they look. Well done! These bars look delicious! No wonder there weren’t any left! Oooh LOVE these! Look how gooey they are. Smores are the best! Okay, I just had to let you know that your opening photo is PERFECT! Really, awesome. Bravo. I agree, s’mores & summer are a perfect pair! These bars look delightful! Looks so goodd!!!! Help meee!!! Going on a hunt to find Hersheys bars and a graham cracker substitute first thing tomorrow! YUUUUMMMM! Thanks for this recipe, You’re too funny! I love it! Holy mother these bars are incredible Glory! And I just want to say that it’s not fair that Heather gets to enjoy your treats and I don’t 😉 Pinned and shared on FB! 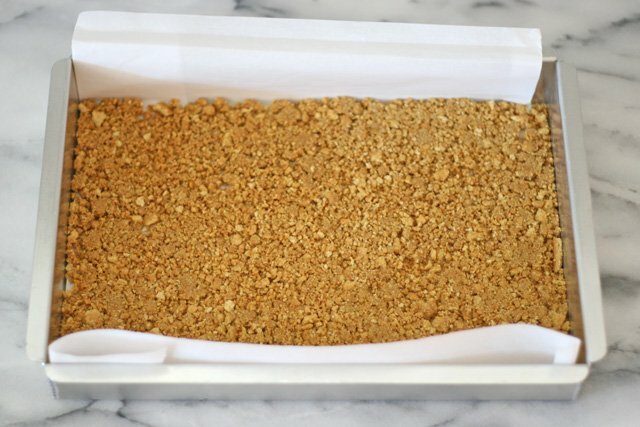 Yum, these bars look delicious! 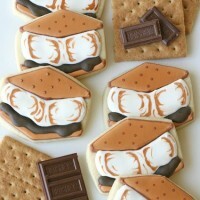 I’m currently dedicating July to s’mores on my blog and these would fit on nicely. 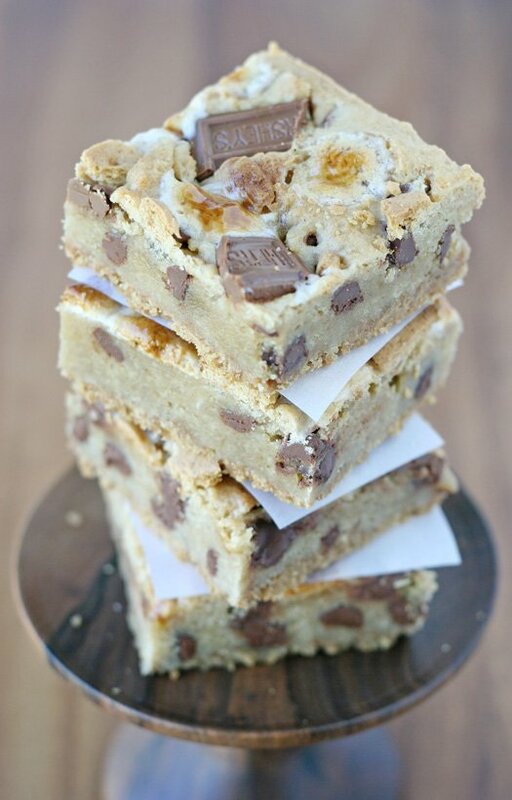 These look amazingly chewy and delicious! I used self- rising flour (i ran out of regular) and they actually came out pretty good (I added a bit more salt). 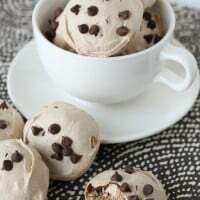 Very easy, delicious, and cute! I’ve made them twice already! They’ve been a hit! Made these as part of a cookie tray for a 4th of July party. They were a huge hit. First cookies to be gobbled up. Everyone raved. This recipe is a keeper. The only thing I did differently was to wait until the last 15 min to put the 1/2 cup marshmallows on and I put the broken chocolate bar pieces on while it was done and still hot out of the oven. I just didn’t want them too melted. Thanks for posting! I made these for a gathering of friends last weekend and they were a hit! Even the people who don’t generally eat desserts loved them. They were super easy to make and are definitely going to become one of my go to recipes. Thanks!! Made these for my family, everyone LOVED them. Thank You! These sound so yummy and easy!! You get the taste of a smore and less mess!! I love your site… its the only baking site I view.. what I love most is your photos (ideas) and your parties. Keep up the good work! PS are your girls still going to private school? hope so! Many blessings to you and your family! Made these for 4th of July, delicious! Both kids and adults enjoyed them. After cutting, I refrigerated the bars, I worried that the hot temp would make them too soft. I took them out half an hr prior to serving, the texture of the marshmallow was not affected, they stayed fluffy and soft. Can’t wait to make them again. Hi Paola, I’m not familiar with digestive biscuits, but I have had other international readers mention that they are quite similar to graham crackers. I would say give the a try! These look so good! S’mores are a must in the summer! I love that no fire or sticks are required to make these! Hehe! I have only made the recipe as listed. Feel free to experiment, but your results may vary from mine. Yes, the listed temperature is correct and I’ve made them several times as listed. I bake mine in a metal (stainless steel) pan, so that might make some difference if you are baking in glass by chance? Also, my best guess is that if you let them cool even longer they will set up a bit more. The cooling time will vary based on your baking dish and home temperature. They should be FULLY cool (not at all warm) when you cut into them. If you haven’t cut them all yet I would say to set the pan aside and give it more time. Worse case, top an underdone piece with a scoop of vanilla ice cream and I’m sure it will be delicious! I made these yesterday for a potluck/BBQ, and they were a big hit! Everyone was asking for the recipe! I was lucky to get the last one before they were all gone! I’ll have to make them again, though, as my family missed out on them while they were in the pool! I had trouble with these at 325 also, for some reason. I have it in a metal pan, but after 40 minutes it was brown on the sides but a big jiggly mess in the middle. I ended up baking them another 15 minutes before they looked done. I have a couple hours to let them cool, thankfully. I hope they’re all done in the middle. The batter puffed up so much it covered all of the Hershey bars so it isn’t pretty like yours, but that might settle. It smells great! Based on your recipe, what do you mean by vanilla? Vanilla extract? Also, which flour did you use? Please let me know as I really want to make these! Made these today and they’re awesome, thank you! Was just wondering if you had any trouble with the crust crumbling a bit? It didn’t full stay in tact but they still taste great. These look so amazing! Smores is my favorite dessert ever, can’t wait to try them in this new form! Quick question, do you do anything special to the marshmallows or chocolate on top? My oven cooks fast and I wouldn’t want them to melt everywhere. Any tips or suggestions? I made these yesterday and they were delicious! Mine came out much thicker than the picture, so I thought maybe I should have used a larger pan, but the directions do say 9×13. I also had some problems with the graham cracker crumbs being too crumby. I used the pre-packaged crumbs, so perhaps they didn’t absorb the butter the same way. (But there weren’t any complaints!) Thanks for the recipe. It’s a keeper.